Places I've Eaten: FOOD ROAD TRIP: RUDY'S COUNTRY STORE AND BAR-B-Q SAN ANTONIO TEXAS YA'LL! 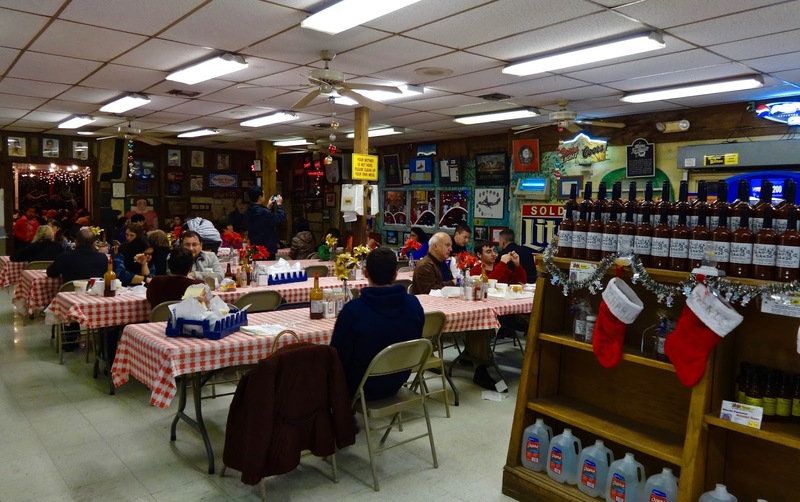 FOOD ROAD TRIP: RUDY'S COUNTRY STORE AND BAR-B-Q SAN ANTONIO TEXAS YA'LL! After 4 6 day weeks in retail fun land, business slows and it's a good time to get away for the end of the year. That means jumping on a plane and heading down to Texas to catch up with the SO who's been visiting family there since Christmas. I got some fam there too so we will all be catching up. I figured I'd hit some full on meat places while I was here because it is Texas after all and you can't come down here without having their version of barbecue. (hint: it's a lot of smoked stuff) Searching out which places seem to have a following in the San Antonio area several names come up. 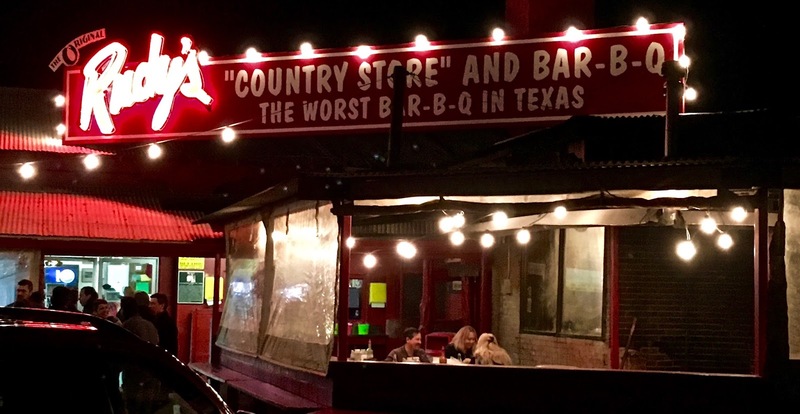 One is called Rudy's Country Store and Bar-B-Q, a place that started out as a gas station/country store and then morphed into a chain of roadside spots to get your smoke on throughout the Southwest. We decided to roll in there the other night after seeing that Star Wars movie thing to fill our bellies with meat, and other stuff. nothing like a tongue in cheek sign to get people to stop in. This is an old-school, down home place with plastic table cloths, long communal tables and folding metal chairs (to keep you from staying too long). You order up at a counter where things come in pints, gallons and variations of a pound. There are 4 sides and depending on how large your party is they spoon it into to go containers then slide it all down to a different section where you order your meat. Meat is by the pound and comes in brisket, ribs, turkey, chicken or sausage. Fortunately, the folks behind the counter can recommend how much to get based on number of folks and how hungry everyone is. From there you take your large tray of sides in containers and meat on white butcher paper to one of the long tables to dig in. It's kind of like a cafeteria for meat. 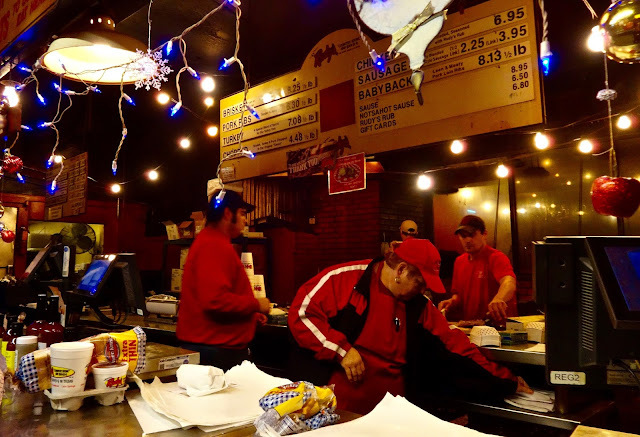 Dropped ceilings with fluorescent lighting are the trappings of un-fancy dining, but that is kind of the point and the "charm" of roadside bbq joints in Texas. It's that down home dining with family kind of thing. I grew up with this in the South where it's all about the food not the decor. Nothing fancy, just good food is the tagline you'd see a lot. This isn't how it comes. You get little square paper bowls to portion it all out between folks. 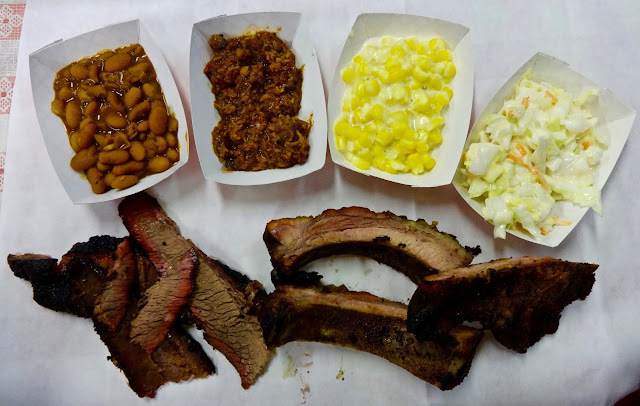 From top left to right what we have here are baked beans, a chopped meat and sauce melange, creamed corn, cole slaw, ribs and brisket. The beans are pintos cooked in a tangy sauce with bits of meat and lots of black pepper. These are not your sweet from a can beans, like the bbq sauce in Texas, they are tangy not sweet and the addition of black pepper gives them a bit of spiciness without the heat. Tasty, though the pepper put it right on the edge of bitter for me and may be too much if you are not used to it. The chopped meat is mix of pork, turkey and brisket mixed with Rudy's own special bbq sauce. I was not the biggest fan of this particular dish. Something in the flavor was just off to me. Small chunks of the meat were dry even though with all the sauce. Somewhere between the flavor of the meat and the sauce, the blend of the two was a touch bitter bordering on harsh. Not sure exactly what was making my tastebuds reject this. For me it was somewhere between anise and fennel, two flavors my tongue just cannot appreciate. I got through 4 or 5 small spoonfuls just to make sure it wasn't an initial thing that would wear off, but it wasn't and I couldn't finish what I had. Creamed corn is evidently a specialty here and of all the things we had, it did not disappoint. A mix of yellow and white corn in a creamy white sauce that isn't too thick or thin and isn't too sweet either. It was by far the best dish to me. I could have eaten a whole pint or more of it by myself, but you know, that whole sharing thing. I also sprinkled just a tad of black pepper over it and it blends so well to between the spice and the sweet. It was like a warm childhood memory that was also very satisfying. The cole slaw was a bit one note with a tad too much mayo. This is something that could have benefited from salt, pepper, a little less mayo and maybe a splash of vinegar. It also veered a little toward the sweet side which is why the pepper I put on it helped balance that, but it still had more mayo on it than I wanted. Next were smoked pork ribs. These aren't fall off the bone ribs but they are tender and the meat pulls off easily. There is a black pepper and spices rub on the outside that helps give it some nice char. These also aren't mesquite wood smoked like other places you'll find in Texas. They use oak which gives it just a mild smoky flavor without overwhelming the meat. Smoke as flavor notes is fine, as long as it is not all you taste and they've got a good balance of it here. I will say these were not as juicy as I was expecting though. Same can be said of the brisket as far as smoke and seasonings go. Though the slices we got were not quite as juicy as I was expecting. They fell on the dry side of things kind of like the ribs. The meat was still tender, but I guess I was expecting it to have rested long enough for the juices to stay in the meat. Rudy's also makes their own bbq sauce to dip the meats in and it is a tomato based thing that is heavy on black pepper and spice and not sweet, even a little bit. I kind of prefer that as sweet sauces can be cloying and you can't eat too much without feeling like you'll go into sugar shock. Because the meat wasn't as juicy as expecting I used the sauce quite a bit to liven things up. One other aspect that came into play was by the time you get your order, find a place to sit and settle in, the meat cools off really quickly and it might have been nice to try it hot out, right of the smoker to see if there was a big difference. As is, I just have to go on what I had. Rudy's was good enough, though I'm not gonna say it was the best stuff I've ever had. Big thumbs up for the creamed corn, the sauce and the rub on the meat. The rest for me was just okay. But let's be honest here, bbq is very regional and very taste specific. In the South it's the vinegar and smoke, in the Midwest it's the sweet sauce and spices, in Texas it's the rub, the smoke and the slightly spice sauce. Everyone has their favorites and can argue down the details about why it is the best. It's obvious Rudy's has it's fans, they place was literally non-stop humming even on a Monday night. Thus I'm not gonna say you shouldn't try them. For the creamed corn (alone) and the ribs dipped in the sauce, I'd be perfectly happy eating there again. But if given a choice between them and another place, for now I'd choose another place just so I could see how they treat their meat. Then I'd have a better comparison to see who does it better and be able to confidently join in the great bbq debate. As a side note, it's a thing here to give slices of old school white bread to have with the barbecue. Because there were 4 of us we literally got a whole loaf. I searched the web to try to find out why white bread but outside of "it's tradition" or "it's just easier", I couldn't really find the original reason why. But, for your enjoyment, click here for a whole Reddit thread on just that topic.